Different printers can carry out different tasks and some are more advanced than others. For that reason, you should think about what you’re actually planning to use the device for. For example, if you need to scan, photocopy or fax your documents, it might be a good idea to consider a multifunction printer. Although these may cost more initially, they will save on energy, which reduces your carbon footprint and overall utility bills. Having one device, rather than several, will also free up some space for other furniture and/or equipment. Before you can spend your money on something new, you need to know how much you can justifiably spend. Remember that you don’t always have to spend a fortune to receive a decent quality product. In addition to the initial purchase, you’ll also need to consider whether or not you can afford the on-going upkeep costs. For example, some printers have cheaper cost per pages than others, so bear this in mind before you decide. Before you can decide on a new printer, you’ll need to make sure you have somewhere to put it. Choose an appropriate spot near a plug socket and measure the area to ensure there’s enough room. By being prepared, you’ll avoid disappointment on the day of delivery. We do not lease printers, we offer the THIRD WAY… ensuring that your organization has the equipment it needs to succeed without a high initial outlay or an unpredictable budget. our EASY solution ensures that you only speak to us. If you become a client of us, you will not need to speak to a bank or finance company and will only have a contract with us. If you have an existing contract with another company, we can negotiate to settle this in advance to ensure that you have the flexibility you need to find the perfect solution. Our EASY agreement makes obtaining your print solutions through us even easier, with straight-forward contracts and ongoing account management from a single provider so your users get the solution they need with minimal admin time and costs for the agreement. We receive no money up-front, as we believe in providing high levels of service and support right through the term of the contract. Handing a potential customer one of your business cards creates a personal and physical connection that is normally lacking in the digital world. Next time you attend a networking event, remember to take your business cards along with your name, address and other important contact information so that it will be difficult for people to forget you. You can’t expect people to notice your brand if your deliveries are sent in a plain parcel. Print your logo on a sticker or address label and add it to the packaging. In doing so, you will not only look professional but prospective customers will think about your brand when they see your parcels. Try and persuade people to talk about your brand by sending leaflets out with customers’ orders, so that they can pass them on to friends and family. Perhaps add a code giving potential customers a discount to encourage them to buy with you. Showing your customers a little appreciation will go a long way. Send them a personal thank you note with their delivery so that they know you are grateful for their service. Loyalty cards are a simple yet effective way to ensure your customers return to your business for their next order. Simply print some off with your branding and send them with deliveries. People often carry their loyalty cards around in their wallet or purse, so you might get some free advertising as well as repeat customers. Businesses seem to fall into two main camps; those to aim to go ‘paperless’ and those who depend on printing for their day to day admin. However, most offices could implement a few simple changes and significantly cut down on waste and excessive printing. 92% of people say that they print more than they need and then throw away up to a third of what they print. This waste costs Malaysia businesses millions every single year. These simple tweaks to your existing system can result in significant savings, both in terms of your monthly lease costs and your daily printing requirements. For a more in-depth review of your print environment, please do not hesitate to get in touch with a member of our team- 0167117619. 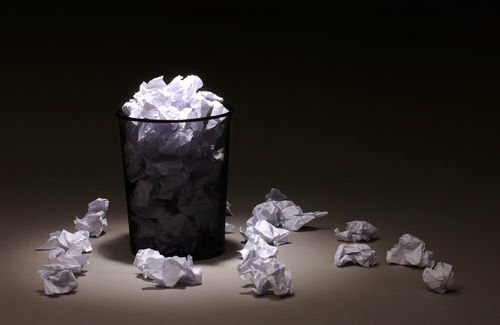 Paper jams are universally irritating – repeated issues can seriously slow down office processes and cause delays to meetings. Luckily, there are quite a few things that you can do to reduce your risk of paper jams or eliminate them entirely. Some of these are quite well known, while others are a surprise to most people. Is Your Paper the Right Side Up? For example, most people don’t realise that printer paper has a ‘top’ and ‘bottom’. If you look at the packaging on your paper, you’ll see a small triangle and information about which side should face up in the paper tray. If you’re having repeated issues with a particular lot of paper, try turning it over to see if that helps. Another thing that causes paper jams is moisture. Paper needs to be stored in a cool, dry place to stop humidity from affecting the supply. It also needs to be the right kind of paper for the machine. 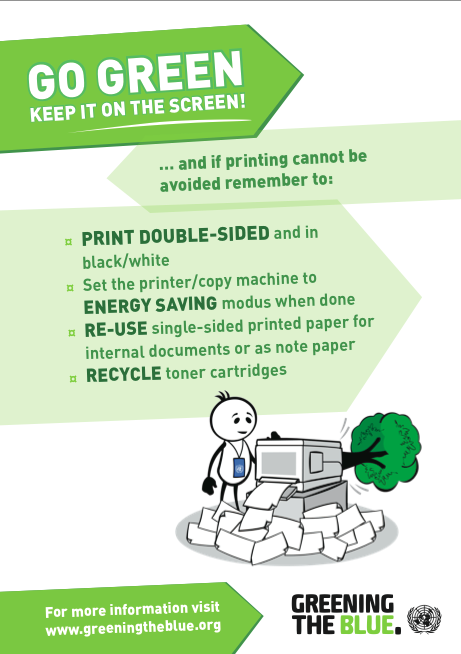 By following this simple advice, you can eliminate the irritation of paper jams from your office. Paper and paper specifications are extremely important to a smooth print process, so it’s important to use the right consumables for every single printer and store them correctly. If you still have ongoing issues with paper jams, please don’t hesitate to contact us 016-7117619, One of our engineers will take a closer look at your machines. The majority of office environments need more than just a simple printer to deal with day-to-day document management. Modern printers do more than just print: many can scan and copy too and are able to handle significant volumes of work. Multifunctional devices (MFDs) often have extensive capability, allowing them to deal with large volumes of printing and very high-quality printing for marketing material, including a variety of different paper sizes and types. Mode recommends the print management solution that’s right for you, so you don’t need to know whether an MFD or printer is best for your document environment. Just let us know what you need to do on a regular and ad hoc basis and talk to us about your challenges. We take the time to listen to what you really need; we employ our knowledge and experience to satisfy your requirements and ensure that the solution fits in your physical space. Our experts will use this information to tailor a solution specifically for your needs. Simply put, if your current solution offers scanning, fax, copying, collation or finishing in addition to simply printing out documents, it’s likely that you will require an MFD to replace it or risk having to add multiple machines to the office. However, if you find that your office does not use these functions at all or does not require a system that can also cope with faxing (for example) we will offer a solution that better fits your needs without having to support unnecessary functionality. Managed Print Services depend on computer software to keep an eye on print activities; this involves seeing patterns in print behaviour, creating rules for printing, authenticating users, managing devices, planning for changes, and creating established workflows. In short, it helps you make better use of your printers by giving you a way to monitor and control how your staff use them. 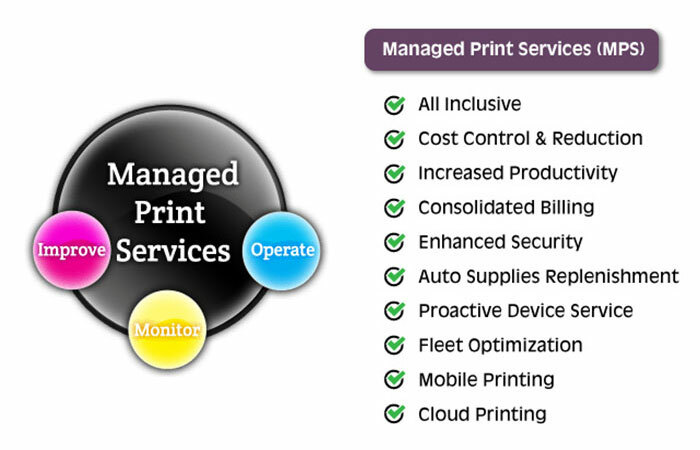 Cost reduction, control, and convenience are the main benefits of any Managed Print Solution. Proper implementation and intelligent analysis can reduce print and copy spend by up to a third, while anticipating the need to order consumables can ensure that your print runs more smoothly with no unnecessary down time. Your solution will offer a number of tools to allow you to analyse and optimise your printing – this includes looking at print behaviour by department, user, or entire floor to see where you can make savings. You can then create rules to prevent people from wasting money through unnecessary printing or simply to reinforce your business’ print policy. You can also use Managed Print Services to ensure that your print jobs are secure, whether you need to apply the rules to the entire business or just a single department (which is particularly useful for businesses with in-house HR or legal teams). Most solutions allow for different types of authentication to suit your business needs. Workflow automation is one of the main ways that MPS saves times for your employees. Once your processes are set up, you receive Process Optimisation Reports with further insights and suggestions so that you can continue improving your print environment. Scanning your paper documents allows you to convert them into easily accessible and convenient digital files, which is ideal for office environments. You can share electronic documents with your colleagues at the click of a button and protect them from things like misplacement or theft. The simple process involves passing a paper document through high quality scanning equipment, which converts it into image form. It is then saved to a PC in the desired location with an appropriate file name. If you’re still not convinced that scanning is the way forward, we have put together three of the greatest benefits of scanning your documents. No-one likes a cluttered desk and filing cabinets take up unnecessary space which could be used for something more productive. If you organise your documents electronically, there will be no need to worry about where you’re going to store them. The data that you can store on one lone DVD can replace nearly thirty filing cabinets. It will also be much quicker retrieving files on a computer than searching through hundreds of sheets of paper. By saving a scanned version of a document to your laptop or other portable device, you will be able to access it even if you are not in the office. This, in turn, means you have less to carry around if you happen to be out for a meeting or working remotely. Data security is often a big deal for businesses and having a cabinet full of important documents is fairly risky. It’s easy for things to go missing or find their way into the wrong hands. When documents are stored digitally, passwords can be set to eliminate any security issues and there is no way for them to be misplaced. Our experience tells us that the best way for us to understand what you need is to visit you and see your document environment first-hand. We like to hear from you directly, to ensure that you get exactly what you need, when you need it. One of our Account Managers comes to visit you to complete an audit and assess your workflow. We get to know more about the challenges you face so that we can find ways to make your processes more effective and to save you money on your printing. Having spent some time with you, we can proactively make recommendations to improve your document environment through cost savings, settling old leases, and removing old equipment as well as providing the very latest technology solutions for your workplace. Once we’ve scheduled a convenient date to install your new equipment, we work with you to ensure that installation is completed with minimal disruption to your day. Our on-site IT Engineer ensures that the new equipment fits seamlessly into your existing systems and liaises with your IT department to answer any questions and provide technical information. Our IT Engineer will also ensure that you and your users are trained on the new devices. Our dedicated service and supplies line is always available should you need to order more consumables or need help on-site. We can troubleshoot maintenance queries on the phone, or if you prefer, one of our local engineers can pay you a visit. Our proactive approach and reporting mean that our clients rarely need an emergency call-out. If you choose one of our bespoke print management solutions, we will automatically receive reports about your consumables and other key data so we can send out toner or suggest optimisation without you getting in touch first. We can even remotely audit some of your parts so we can replace them before they cause issues for your machine. Our preventative maintenance and servicing minimise downtime and ensure optimal efficiency for your printing machines. Key Difference: A copier is a photocopying device that allows users to make duplicate copies of a document or an image, that too cheap. Copiers use xerography technology that is similar to the technology used in a laser printer. Printer is a peripheral device that creates a solid copy of the digital data that is represented on the computer screen. Printers can be used to connect to a computer using a USB or wirelessly. When thinking about creating duplicates for a document, two things come to mind; one can print two or more copies or one can photocopy the original document. These two options are because of two devices a copier and a printer. With the increasing technology, many people are confused in these two different devices as many multi-purpose printers come with copier features. It’s quite simple to distinguish as a copier’s main purpose is to make duplicate copies, while a printer’s main purpose is to print. However, a multi-purpose printer is able to do both and much more. A copier is a photocopying device that allows users to make duplicate copies of a document or an image, that too cheap. 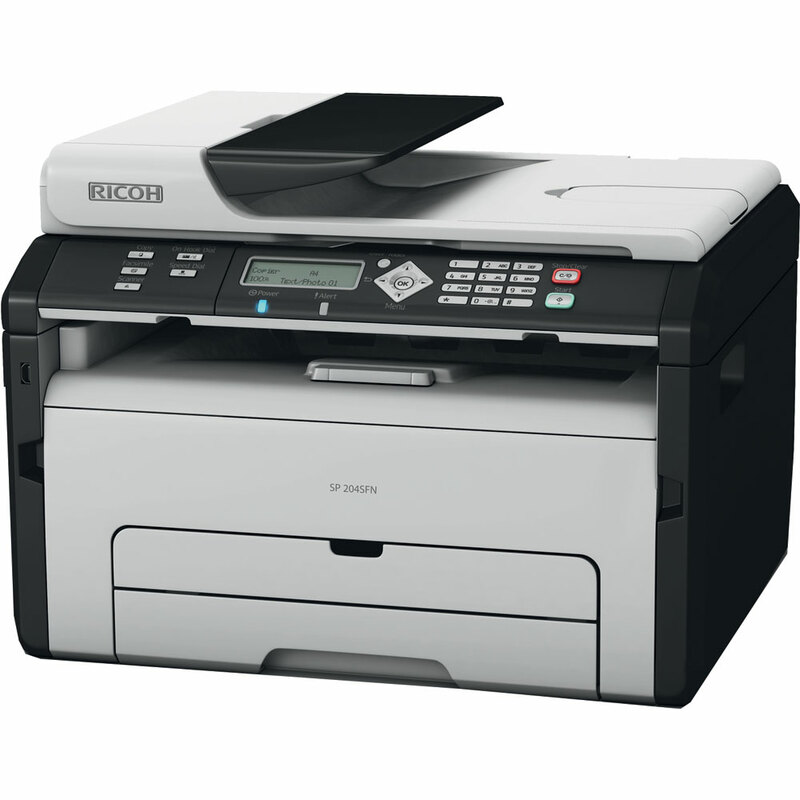 Copiers use xerography technology that is similar to the technology used in a laser printer. Xerography is a dry process of creating an image by applying toner and heat to the paper. The purpose of a copier is to create a duplicate document that is available faster and cheaper. Copiers were an alternate option to printers, which were initially expensive and time consuming. Modern copiers have become multi-purpose and are available with features such as printing, faxing, stapling, hole punching and other capabilities. 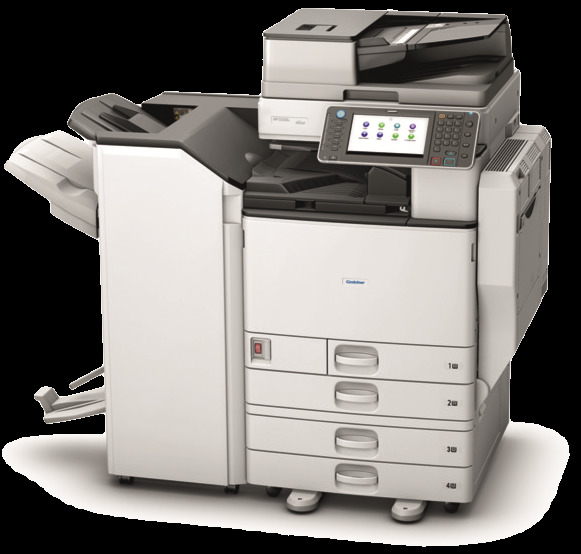 A copier is usually a huge device that takes up room and is able to duplicate multiple different types of paper and documents. The device works in 5 steps: Charging, Exposure, Developing, Transfer and Fusing. A cylindrical drum present in the machine is charged electro statically by a high voltage corona wire. The drum then develops photoconductive material. A bright lamp scans the document that is to be copied and reflects the white areas of the document on to the photoconductive drum. The photoconductive drum becomes conductive when exposed to light. The black portions on the document do not reflect and that portion on the drum remains negatively charged. The negative charges pick up the positive charged toner, which is then transferred on to the document and fused by heat.The document is copied and printed. Printer is a peripheral device that creates a solid copy of the digital data that is represented on the computer screen. Printers can be used to connect to a computer using a USB or wirelessly. One printer can also be connected to many computers allowing all computers to be able to print on that printer. Many newer printers are also able to support memory cards, digital cameras or scanners. 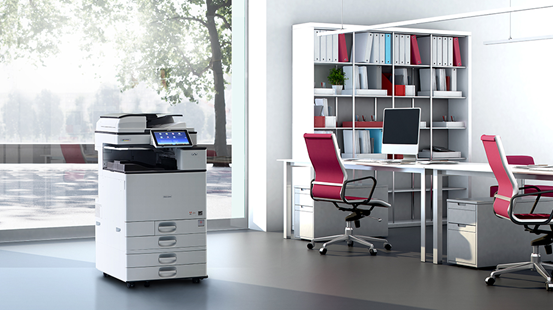 Higher end models for offices also come with other features such as scanner, copier and fax. These models are known as Multifunction printers. There are various different kinds of printers that are available. These printers are classified depending on the type of technology is used in printing. Technology includes: Toner-based printers, Liquid inkjet printers, Solid ink printers, Dye-sublimation printers and Inkless printer. Toner-based printers use dry powered toner as ink, which is then fused on the paper by hot rollers. Liquid inkjet printers use liquid ink that is heated into a vapor bubble and then sprayed onto the paper. Solid ink printers use thermal transfer technology and use solid sticks of color that are wax-like in texture; these inks are melted and then sprayed on a rotating, oil coated drum, which passes the image onto the paper. A dye-sublimation printer uses heat to transfer dye to a medium such as a plastic card, paper or canvas. Inkless printer printers work by heating regions of a heat-sensitive paper that creates images or text on it. Many believe that printing multiple copies is more expensive than photocopying it. However, it depends on the number of copies, pages and the data on the paper that need to be printed. If many copies are to be printed, then copiers are usually a cheaper option. 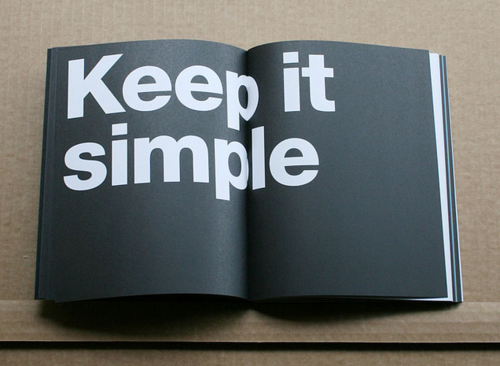 However, if only a few pages need to be printed, then printing becomes much cheaper. Another major difference between the printer and the copier is quality. Printers usually produce high-quality images as they use the inkjet process (which is also available in copiers but quite rare), while images are produced using xerography are low resolution. Print management is the concept of combining all printing via copiers, fax machines and traditional printers under a single strategy to manage and optimize their use. A print management strategy will help you manage the printing environment of your business, optimize your infrastructure, and improve workflow processes. You can also outsource your print management to a business solution company to fulfill all of your printing requirements. Therefore,we are dedicated to identifying and designing systems that support your operational needs with reliable and scalable business solutions. From telephone systems to printers & copiers and network services, we provide technology hardware, support, and training for your business. Your office copier is one of the most important tools in your company’s arsenal. When it is down, your work come to a grinding halt. Knowing how to properly care for your copier is one of the most important parts of running an efficient business. 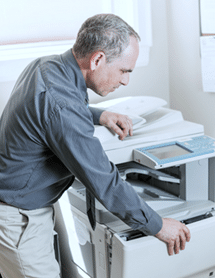 Here are some tips from the copier service experts. Before you start cleaning or maintaining your machine, make sure you turn off the power. This will protect you and your machine from electrical accidents. Check with us or the manufacturer to ensure you are using the best possible paper and toner for your copier. Higher quality paper will result in less dust inside the printer, which, in turn, will mean less need for maintenance. Load the paper as you should, and avoid jamming it into the copier. Make sure that you do not load wet or folded paper into the machine, as this could cause it to jam. Cleaning your copier regularly will extend its life significantly. To clean the glass, spray a lint-free, nonabrasive cloth with glass cleaner and clean the glass. Do not spray cleaner directly on the glass. Protect the glass from scratches by removing paper clips or staples before scanning your documents. On the interior, clean any visible dust by wiping it clean. You can remove dust on components with a small, fine-haired paint brush to clean the interior components of the machine. Dust the paper trays, ink cartridge holders and any other parts where dust from the paper can collect. Do not use pressure that could damage the copier. Also, don’t forget to dust the exterior of the machine while you are working on it. Finally, clean the top of the ink nozzle with a cotton swap dipped in rubbing alcohol. In spite of your best efforts, your copier is going to take a beating. It’s a work machine, after all. There are components and places within the copier that you can’t reach to clean. Make sure these stay in good working order with regular maintenance service checks from a qualified service professional who knows copiers well. This will extend the life of your machine significantly. If you are looking for a professional team to service and maintain your copiers, please contact +60167117619. 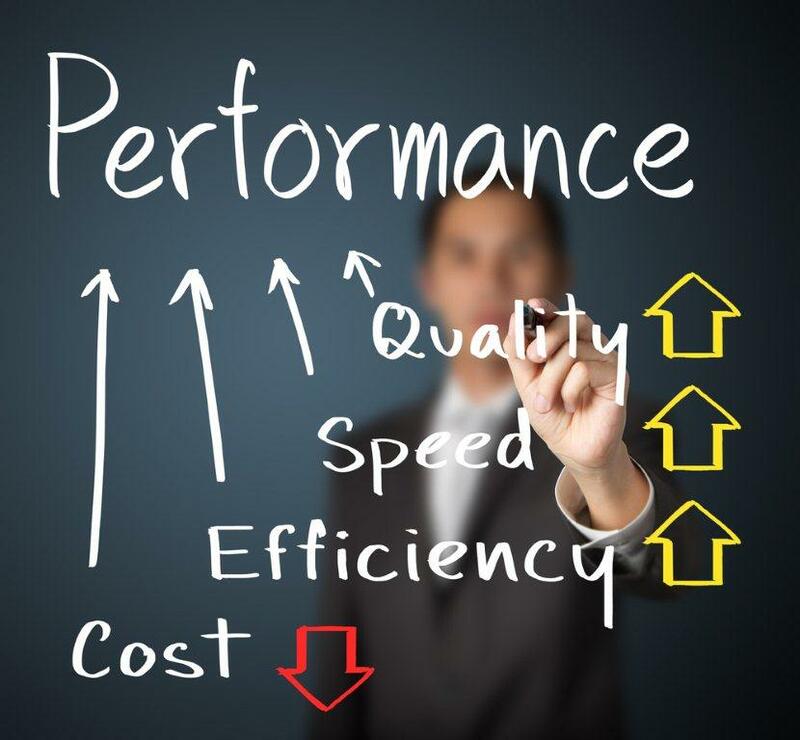 We will provide you with prompt, reliable service to help keep your office running at its best.